It says Leave the European Union. Countries like Norway and Mongolia are not in the European Union, and they have very different relations with the European Union. Hence we cannot conclude from the question what variant of Brexit the British voted for. A Norway-style relationship with the EU would be a Brexit – because Norway is not in the EU. A Mongolia-style relationship likewise. To put it another way, we cannot draw any solid conclusions – in any sort of way – about what variant of Brexit the Brits voted for, or what sort of relationship the UK should have with the EU after Brexit. 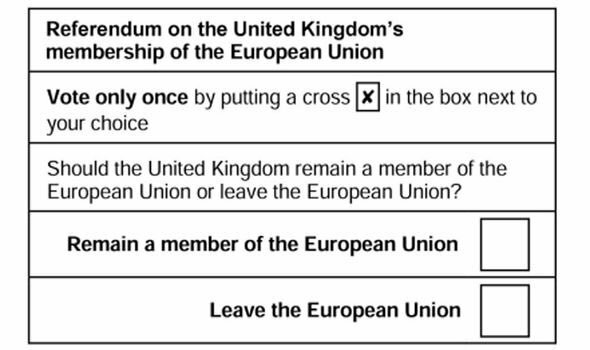 You can make a case for all sorts of relationships the UK should have with the EU, and they all have their various merits, but what you absolutely cannot do is draw solid conclusions about what that relationship should look like based on what happened before 23rd June. That – in the words of Jason O’Mahony – is refjacking (referendum-hijacking), or the process of attaching significance to something after the fact. And note here: I am most definitely not saying that Brexit means a Norway option, or something like it, either – because it doesn’t. We simply do not adequately know. That of course does not stop Brexiteers trying to do just that – to justify what the UK-EU relationship ought to look like based on their own interpretation of the referendum – but dressed up as fact. By all means make a case for whatever variant of #Brexit you want. But don’t try to justify it on basis of the Q or the ref campaign. There was absolutely nothing in the referendum question, and indeed pretty little in the debate, to conclude #Brexit must mean Hard Brexit. Hard Brexit is a term of denial. A fabrication.
? ?to leave ? ?exactly as per ref. That's left field Jon ?? 4 freedoms were all part of debate & central to issue; flatly, 100% rejected. @laurenceevans1 Your evidence for that please? Every single person among the 52% who voted Leave rejected them? Get real. @laurenceevans1 No, still no. There is NOTHING in the way the referendum Q was phrased to rule out a Norway arrangement. How can there possibly be variants of leaving the ??? And then an opinion piece from Norman Lamont FTW! Crystal clear to all voters that leaving ?? meant leaving 4 freedoms which means ? ?likely to deny full SM access.